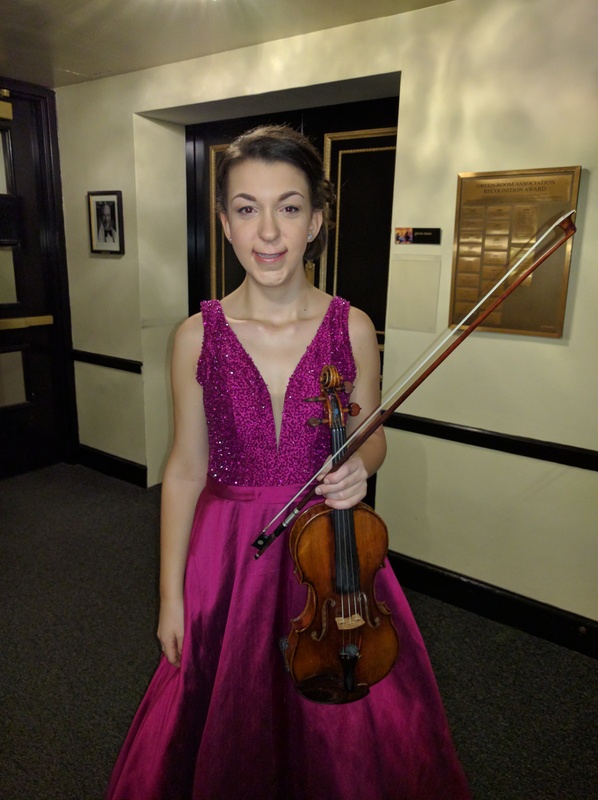 The St. Louis Symphony Orchestra and Make-A-Wish Missouri teamed to make a young girl’s wish come true in October. Faith*, who is eight-years-old, wanted to experience an SLSO concert. She was born with SOX2 anophthalmia syndrome. The genetic condition left Faith blind and with limited mobility. On October 8, SLSO musicians Melissa Brooks, Celeste Golden Boyer, Beth Guterman Chu, and Eva Kozma performed three pieces of music for Faith at St. Francis Xavier College Church. St. Louis Symphony IN UNISON Artist-in-Residence Brian Owens was the featured vocalist for the concert. 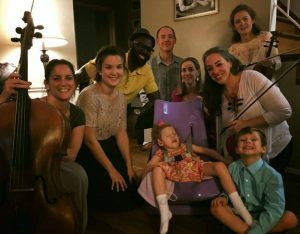 “To see the string quartet and vocalist so dedicated to making this happen for her was special to us,” Bridget said. “It really was it was an honor to play for her,” Brooks said. SLSO violist Beth Guterman Chu agreed. “Anytime we can touch anyone it is special, but to know that this was Faith’s dream, was a real high point for me,” Guterman Chu said. Faith’s Make-A-Wish also included a private concert in her home on October 4. The musicians performed two pieces of music, including a piece by Tony Bennett. *For privacy reasons, the SLSO is not releasing the family’s last name. The St. Louis Symphony Orchestra’s 2017-2018 season opened with a two-week celebration of Mozart. Pianist Emanuel Ax was the featured guest artist. Ax played the piano with precision, poise, and passion for during the performances. Ax split his time between playing piano concertos and meeting music students. 8-year-old Oscar Ramirez, who is a blind, spent time with Ax backstage and onstage before a performance. “It was really cool and fun,” Ramirez said. Ramirez dreams of becoming a concert pianist. Ax also visited Jennings High School. He performed for the students and held a question and answer session. James McKay, the Jennings School District orchestra teacher, helped lead the question and answer session. “It was a really phenomenal experience to have someone who has won seven Grammys right here in our school district,” McKay said. Ax also invited the Jennings students to Powell Hall for one of his performances. “It’s just a pleasure to meet people that love music,” Ax said. For a finale to remember, Ax went to a St. Louis Cardinals baseball game with SLSO staff members. Each spring, 3rd, 4th, and 5th graders take over Powell Hall for the St. Louis Symphony Orchestra’s Link Up concerts. The students participate in the concerts. They play recorders and violins along with the orchestra. The students also sing and dance. The concerts are the pay off for months of hard work that starts each fall in greater St. Louis area elementary schools. According to 5th grade Hazelwood student Jaylah Burton, the program offers her a way to connect with her parents. Link Up provides music educators with specialized curriculum that prepares students for the concerts. The curriculum comes from the Weill Music Institute at Carnegie Hall. The help from the SLSO and the curriculum is free. The SLSO is searching for more schools in the region to Link Up with this school year. The St. Louis Symphony, Circus Flora, and Build-A-Bear Workshop are partnering for series of performances for children at area hospitals. Violinist Angie Smart and Claire “the Clown” Wedemeyer from Clowns on Call provide the entertainment. The performances are a mixture of music and comedy. Smart plays crowd favorites and Wedemeyer keeps the children laughing. It is a routine Smart and Wedemeyer have perfected. The pair have been performing at area hospitals since 2012. In addition to the entertainment, each child receives a stuffed-animal from Build-A-Bear Workshop. Kira Stout, 9, attended one of the performances at Mercy Children’s Hospital in 2016. Her father, David Stout, said the performance served as an entertaining escape. The hospital performances are part of the SymphonyCares program. The goal of the program is to enrich people’s lives through the power of music. Hava Polinsky moments before her performance. Hava Polinsky, 17, shed tears of joy when she left the stage at Powell Hall on New Year’s Eve. “It was just so emotional,” she said while wiping tears from her eyes. The St. Louis Symphony Youth Orchestra violinist was the surprise guest artist for the New Year’s Eve concert. Polinsky joined the St. Louis Symphony Orchestra to perform Pablo de Sarasate’s “Zigeunerweisen” (Gypsy Airs). She was poised, precise, and professional on stage. Polinsky has been honing her skills with the Youth Orchestra for the last for six years. However, the teenager was visibly nervous in the moments leading up to her performance. 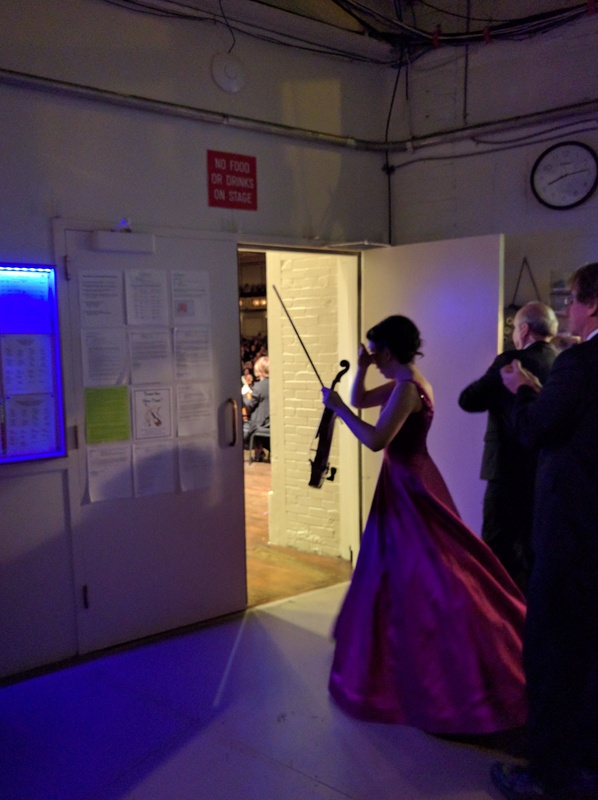 She paced back and forth as Music Director David Robertson began her introduction. That is when the STL Symphony’s Jack Snider took charge. Seconds later, Polinsky was dazzling a packed house at Powell Hall. “That Polinsky was good,” one audience member said. It was the perfect way for the STL Symphony to ring in the new year. Hava Polinsky wipes away tears of joy after her performance. Music from Syria, Somalia, and beyond filled the SLACO Community Center in North St. Louis during a recent concert. The Strings of Arda ensemble traveled to the community center to take more than 30 immigrants and refugees on a musical journey. The ensemble consists of six musicians from the St. Louis Symphony. Most of the people who attended the concert were from Syria and Somalia. Many of the families spent years living in refugee camps before coming to the United States. The resiliency of the families nearly brought the leader of the ensemble, Christian Woehr, to tears. 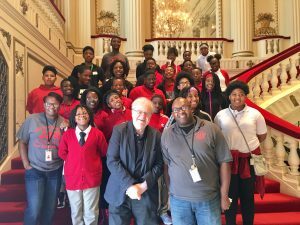 The concert was part of the STL Symphony’s comprehensive Music Without Boundaries program. The goal of the concert was to help families feel welcome in St. Louis and connect on a personal level with the region through music from around the world. “It’s always got a great groove, and it’s such a core part of what really makes a people a people,” Woehr said. Anita Barker with International Institute of St. Louis helped organize the concert. “For them to have an opportunity to hear a concert with world class musicians playing music that is from around the world, and including their own country, was extremely moving for the families,” Barker said. The music is a gift that serves as a comforting connection to the families’ history, and a warm welcome to their future. “It made them feel much less isolated than they normally do,” Barker said. Additional STL Symphony Music Without Boundaries concerts are planned at SLPS Nahed Chapman New American Academy on March 13, Macklind International Senior Center on March 15, and at the International Institute of St. Louis later in the spring. Music Without Boundaries also funds transportation and ticket costs for immigrants and refugees to attend concerts at Powell Hall.